· Living with autism means that sometimes life gets lonely. Finding a babysitter that you can afford and who you trust to leave with a child who can sometimes be exceedingly frustrating and difficult to communicate with is usually next to impossible. Spouses have no alone time and friends get tired too. Eventually the invitations stop coming and I totally understand that. Most days I’m okay with that because I love spending my time with my husband and our beautiful kids. But once in a while I find myself imagining a “date” night with my fabulous husband or a message on voice mail inviting us somewhere with someone for something. · Living with autism means that sometimes a disaster gives you the chance to create something new that’s better that you could have imagined. For example, a few years ago trying to take the Christmas tree down was a total and complete disaster. Caden had gotten use to the lights and he looked forward to turning them on in the morning and again at night. We eventually gave up and just took the decorations off and redecorated for Valentine’s Day, St. Patrick’s Day, and Easter. Then we put our house on the market and our real estate agent made us take the tree down. We don’t leave our tree up year round these days but we do decorate our family room for every holiday and season you can think of (including a few we don’t even celebrate). It’s fun and playful and makes the family room a special place to hang out. · Living with autism means that sometimes you wish you weren’t. Interestingly it usually isn’t the big stuff in our lives that gets to me. Let’s face it between autism, sensory processing disorder, asthma, allergies, gi issues, and the immune deficiency we deal with a lot of big issues so these are (as strange as this is going to sound) rather routine for us. It’s the little things like never going out to eat, not having professional pictures taken, not going on playdates that sometimes sneak up and kick a person when they are down. It’s not having a Santa or Easter Bunny horror story or trying to fill out the “kid book” that hammers home how un-normal our lives really are. · Living with autism means learning another language. This language seems to be made up of an infinite number of letter combinations that everyone in the autism world seems to expect you to know. Days are filled learning all about the benefits of EI, if you are ABA or no, if you have enough hours of PT, OT, and SLP, agonizing over IEPs and IDEA, and knowing that you are truly living ASDs and SPDs. · Living with autism means that you look forward to and dread the future all at the same time. I can’t wait to see the person who Caden becomes and all that he can accomplish in his life but I worry about who will take care of him if he doesn’t progress far enough to be able to be independent. More often though I find myself wanting to slow time so that he can just have a few more minutes to work on a word or a skill or a behavior because I believe with my whole heart that he’s going to be this remarkable man who has a profound impact on those around him. He’s going to be happy and surrounded by people who love him almost as much as I do. · Living with autism means that I don’t focus on autism all that much and instead look at Caden as Caden. Other than a label and access to some resources, nothing really changed in that moment when the team said “you probably already know this but it’s autism.” He was and is my beautiful blue eyed child who has an incredible sense of humor, can add and subtract in the thousands, will sing at the top of his lungs when he doesn’t think anyone is around, and who loves his Ry Ry and Elf more than anything in the world (although blankie and pacifier are close runners-up). I’m pretty sure this wasn’t the answer that she was looking for when she asked me what life with autism was like but this and probably a hundred, no million, other things describe our daily lives. 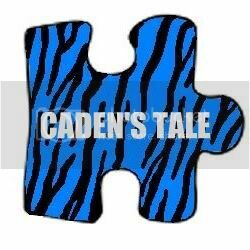 Like I’ve said since I started this blog—Some days the stories are adorable, some days they are horrific, but it is all just a part of Caden’s tale! · Living with autism means appreciating and celebrating milestones however small they might be and even more importantly whenever they occur. I’ve learned over the last 3 years that parenting magazines, developmental charts, and testing are NOT my friend. Sometimes I want to scream, yep he has autism, I get it—he’s delayed, does the universe need to point that out to me every chance it gets as though I don’t notice it when we are in the doctor’s office, the school, the park, or any other public/private place? The thing is though that Caden has made huge progress in so many areas and I know he will continue to in many others but he’s doing it on his timetable and his pace. Maybe that’s a lesson all parents, special needs or not, could learn a thing or two from. · Living with autism means learning a degree of patience that most people will never even dream of, let alone practice minute by minute. Caden can repeat an activity or word a hundred times in a 10 minute period (if it’s a slow day), he can need a simple daily task explained a hundred times, sometimes a thousand, before he understands, “simple” things in life are overwhelming, everything requires ___minute reminders, and routine isn’t only our friend, it’s a requirement in our household down to who sits where at the table. But at the same time…. · Living with autism means making mistakes as a parent. Just because autism tries to teach insane patience doesn’t mean you’ll be able to follow through every day. Sometimes the mouth opens and things come out before the brain has a chance to think. Things like “Caden I told you just a minute,” “Caden you’ve already had 10 extra minutes,” “Caden don’t say that again” and so on and then he looks at us with those big blue eyes, slowly filling with tears, IF we’ve changed our tone of voice enough that he recognizes there is an issue and everything right you’ve done in the last eternity is suddenly gone in the universe. You feel like crap but thankfully autism doesn’t tend to dwell on a moment and we get the chance over and over to do the right, more patient thing again. · Living with autism means that life is rarely fair for siblings. My daughter occasionally points out that there are sometimes different rules and people stare a lot and she’s right. The best explanation that we’ve given her is that instead of thinking of her brother has a 5 year old, she has to realize that in many contexts he is closer to being 3. While that might be a little simplistic, it has helped her understand why he does some of the things that he does and more importantly why he gets away with them. Sometimes all you can do is help siblings understand why it isn’t fair, there’s not a darn thing that we can do to actually equal the playing ground in our house at the moment. Having said that though, she’s his biggest advocate, strongest supporter, and number one defender—although she’s had some tough lessons to learn, I don’t doubt that these lessons will stick with her throughout life. · Living with autism means that you and your significant other will have a lot of decisions to make. There’s not a set therapy option that works for all kids, there is a lot of conflicting research to review, and eventually you just have to decide what you think might work for your child. I think this is the part where so many parents, couples, fall apart. Huge decisions that might very well determine your child’s future made under conditions of high stress with little sleep can easily lead to arguments that are less than productive. We’re lucky in this regard as we tend to agree on these kinds of decisions or one of us feels enough expertise to take the lead. · Living with autism means no spontaneity unless there is a doctor’s office or emergency room involved. I don’t know what else to say about this except that autism requires a precise routine or advanced preparation such that there is no last minute decision to go out to dinner or see a movie or run to the mall. Any deviations from routine require conversations as many days in advance as possible, lots of questions, and usually a lot of anxiety on both parent and child’s part. · Living with autism means really appreciating a moment because the next moment could be altogether different. When I learned that autism is a spectrum disorder, I had no idea that the point on the spectrum could change minute by minute but it does. Disruption of routine, illness, holidays, guests, or sometimes nothing at all can trigger an epic mood/emotional change. Sometimes we go from a major temper tantrum to on top of the mountain joy and I have no idea how or why, other times the change comes as a result of a lot of different tactics on our part. Unfortunately we can go the other direction just as easily. Words, skills, or abilities here today may easily be gone tomorrow. Regression, or loss of skills previously attained, is the reality that we go to bed with every night. Speaking of going to bed…. · Living with autism means that we are tired. Think the kind of tired that comes with being the parent of a newborn, the kind of tired that comes with having a loved one in the hospital, or the kind of tired that comes from hours and hours of overtime on a project at work. Now take that tired and multiple it by years. Autism is inventive in the ways that it keeps you awake: worrying over decisions you need to make and how you’ll pay for them, a child who wanders at night, a child who can’t sleep unless he is in bed with you, or a child who just plain doesn’t sleep. Me “Nothing you need to worry about—it’s bad for you.” This was a rookie trap that I blindly fell into…. Obviously the explanation eventually worked but I’m pretty sure that people in the lobby were disgusted and horrified that I was actually explaining smoking to my small child. I tweeted about this; unfortunately the incident didn’t translate well and I picked up an insane following from the “pothead” community but they dumped me when they realized I wasn’t nearly as cool as that tweet would have led them to believe.